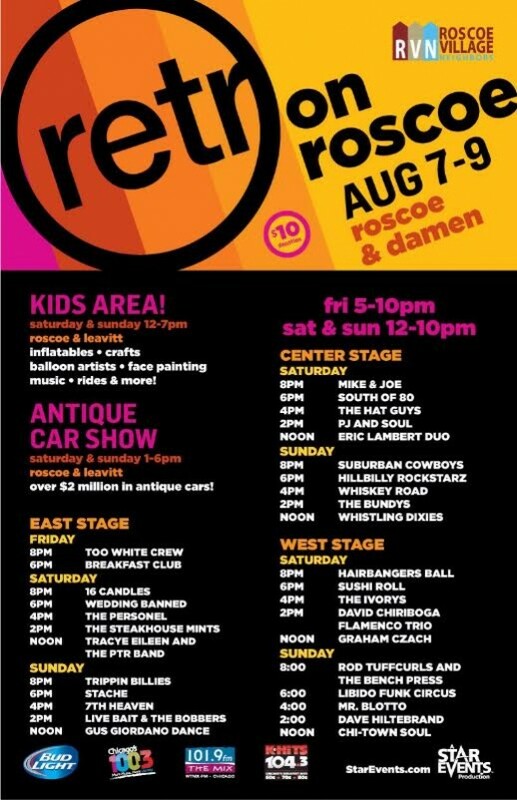 The 20th annual Retro on Roscoe street festival returns August 7th through 9th. For three days, the festival brings you six blocks of amazing local foods, antique vendors, local merchants, along with family friendly activities and live entertainment across the three stages. Check out the lineup below. As always, there’s also the Antique and Classic Car and Motorcycle Show. How: Admission to Retro on Roscoe is a $10 suggested donation. Proceeds benefit Roscoe Village Neighbors, a non-profit organization comprised of volunteers that work hard daily to ensure committed excellence in advocacy of quality-of-life for Roscoe Village, its residents, and merchants alike.